We first stumbled upon this diverse little piece of rock during our tireless search for easier climbs on the northern side of the Island. This side of the island is home to several world-class walls and undoubtedly makes for some of the best climbing on the Brac. The majority of routes here are however fairly overhung and require a tad more skill to master than the average infrequent climber possesses and since we here at Rock Iguana cater to climbers of all skill levels we were searching for a new crag that could be tackled by all, including all our future students. Our interest was first piqued when we spotted a beautiful arête towering above the trees behind the Heritage House, so naturally we headed in to explore. Being our first encounter with this section of jungle we weren’t fully expecting the visage that came into view. A stunning rock-face, perfect for bolting! We were blown away. The rock had countless potential routes of varying degrees of difficulty and there was even a trail along the base of the bluff with wooden stairs and a wooden ladder that leads straight to the top! (A fact we only discovered later when our excitement had subsided somewhat and we could take in our surroundings). We instantly fell in love with this place and set our sights on bolting it as soon as possible. Miha, a former Rock Iguana guide, laboured away for many days to set 7 exciting new routes with 2 extensions, ranging all the way from 5.7 – 5.13+. Finally we had a few easier climbs on the north side right alongside a route that has arguably become the hardest climb on the island. Something for every climber, and all of this right behind the grounds of Heritage House, a charming and educational publicly accessible park. The Heritage House as the name suggests is an interpretive centre capturing the essence of Brac and Little Cayman culture and heritage. There is a gift shop and multiple exhibits on the grounds that display traditional Sister Island homes with thatch work, art, crafts, and more. It also serves as the grounds for many fun and educational events held throughout the year so be sure to check out the Facebook page if you are interested in learning more about the island culture. This area has loads of history so you should definitely take some time to explore. As we would discover later the wooden ladder system near the crag was built by Pedro Lazzari to replace an old ladder built by his father to access his farm on top of the bluff. If you choose to be an intrepid explorer and climb this ladder, we would however advise you to err on the side of caution. The ladder is old and rarely used and the condition is not guaranteed. The crag is located directly behind the Heritage House grounds and can be accessed by a small trail to the right of the obvious boulder. There are some gardens on the grounds so please be careful about trampling any plants and please be respectful if there are any events underway. It is easy to miss the trailhead, but if you find telephone wire “railing” tied to the trees then you are in the right place. A short walk through the jungle and you will encounter the first new route: the legendary May Cow. All of the routes are described below and more info can be found in the Cayman Brac Climbing Guide. We have given most of the routes names that reflect the culture and icons of the Brac, from old duppy stories to more recent Brac festivals. This route is a new classic with beautiful rock and interesting but tricky moves. This route begins with a short boulder problem with a few hidden pockets that make it harder than it seems at first, so it is highly recommended to stick clip the 2nd bolt unless you climb comfortably in the 5.10 range. After that it is an interesting line around corners and bulges until the crux before the last 2 bolts. This is one of the best climbs on the island in this grade. We have had different opinions on the grade with some thinking it is definitely a 5.10 and others thinking it is 5.9+ if the proper beta is followed. Either way, it is a very tricky onsight! This route was named after the legendary May Cow, a mythical creature that inhabits the Brac and appears every May to run amok and haunt areas of the Brac. The May Cow is a giant bovine with glowing red eyes that drags around massive chains and makes horrible sounds to frighten people away from mango groves. Some have theorized that this myth was created by farmers to keep children from stealing their harvest, but others have sworn that they have personally encountered this mythical beast. This route is a short extension for May Cow. Skip the anchor to May Cow and head left up the big roof. Rolling Calf is another name for the legendary May Cow. Hard, steep, and blank; but with beautiful rock and what looks like beautiful moves. This is an open project, meaning no one has finished climbing it, so no one knows if the moves are truly beautiful or how hard they really are. Since this hasn’t been completed before, it probably needs a bit of cleaning for spider webs and loose rocks. This is potentially the hardest route in the Brac and it is patiently awaiting someone to come and send it! Anansi is clever spider that is an important character in Caymanian and other Caribbean folk tales. Anansi is a trickster that uses his wit to manipulate others and expose truths. A fitting name for one of the trickiest climbs on the island. A challenging route that is a sight to behold. Throw up the big pockets on the blank arête, then up the beautiful flowstone. Sustained but rewarding climbing that will have you excited about every move. Braccanal is a festive event held in the Brac every year in May. It is similar to other Caribbean carnivals with plenty of soca, dancing, and costumes but of course with a heavy dose of small island charm that the Brac is famous for. Miha completed the first ascent on the day of the 2017 Bracannal parade. Another classic route full of interesting features and we only wish it was longer! Follow the tufas up the corner of the dihedral and pull some super fun and funky moves to reach the top. It isn’t as slippery as it looks (or sounds). This route is named after the greasy pole competition that is held at the annual Agriculture Show. They grease up a pole and everyone attempts to climb to the top without slipping down. In 2017, many people tried, but only Miha succeeded to reach the top. This route was bolted shortly after the competition. A fun moderate route that is mostly face climbing up the orange rock. The tree is off-root! Ping, ping, ping I am coming is a folk song by the late Mrs. Leila Ross (William and David’s great-great-aunt, composer of the Cayman National Song) describing the vicious attack of mosquitoes that was part of daily life for Caymanians in former years. Mosquitoes are often encountered at this crag after heavy rains so you might want to bring some bug spray along. This climb shares the first 2 bolts with Ping and then heads left at the second bolt to the anchor of Iguana Droppings. Traverse diagonally up the wall for some interesting face climbing. Named after the iguana crossing signs that can be found throughout the Brac warning drivers to be cautious of Rock Iguanas on the road. This species is critically endangered and is only found in Cayman Brac and Little Cayman so please heed the sign’s advice! This is by far the easiest route on the north side and one of the main reasons we bolted Heritage Wall. It is fun climb, but a bit sharp in places so watch those elbows and knees. 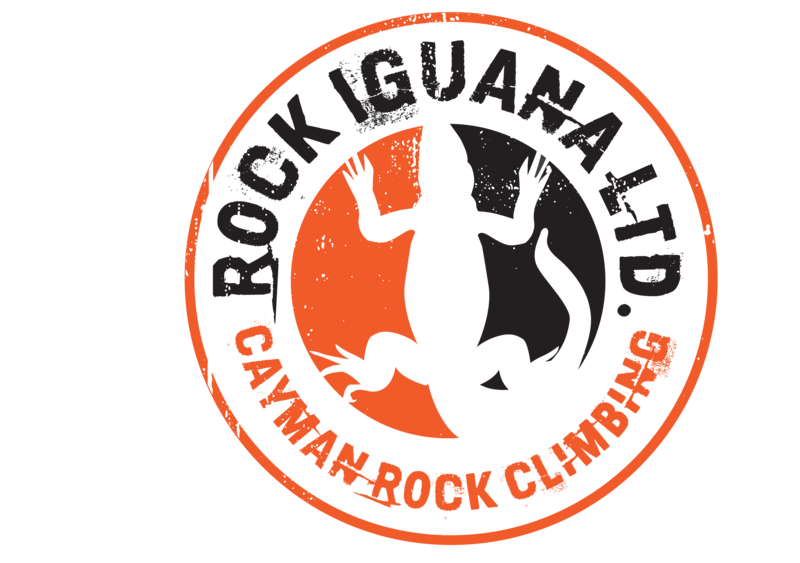 The 2nd climb in the “Iguana” series of climbs named after the endemic Rock Iguana. This is a short but challenging extension of Iguana Droppings or Iguana Crossings. Head straight up from the Droppings/Crossing anchor for a short, powerful, and fingery face climb. 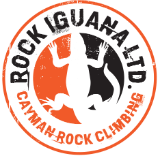 This is the grand finale for the “Iguana” routes and a must-do for all true Rock Iguana lovers. Special thanks to Marique Cloete for helping with this post. I just love dah brac!